This recipe reminds me of a trip to Cuba a few years ago, although Cuba is primarily a Spanish speaking island, it shares many cultural similarities to it’s English, French and Dutch neighboring islands. More often than not when people think of Cuban cuisine they associate it with an assortment of pork prepared in various ways. While I won’t deny that Cuban people are huge advocates for adding pork to their dishes, there’s another side to Cuban cuisine waiting to be explored and this recipe is testament to that. Like many Caribbean Islands, the people of Latin America embrace yuca (aka cassava) just as much as their fellow islanders. 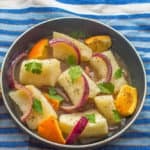 I suppose the western equivalent to yuca would be white potatoes as both vegetables are packed with starch as well as fibre. Actually, white potatoes probably aren’t parity to yuca but that’s the only vegetable that came to the forefront of my mind at the time. 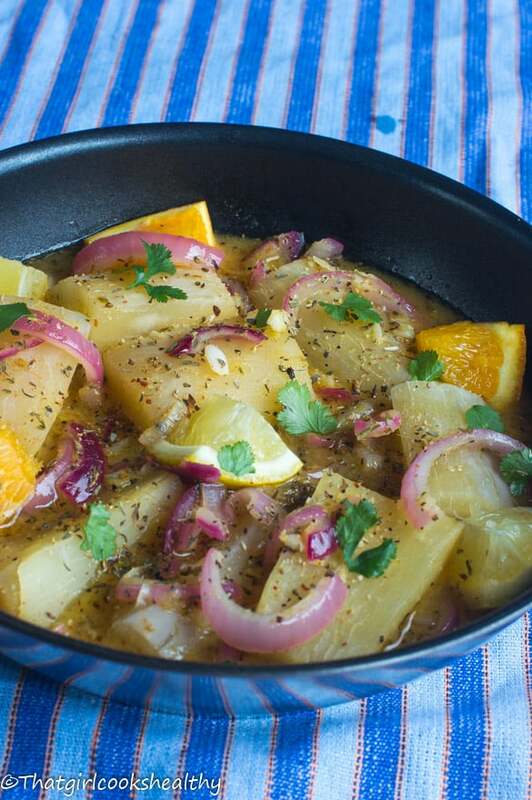 What is yuca con mojo? Yuca con mojo is a popular Cuban vegan side dish made from boiling pieces of yuca and marinating it in olive oil, lime and garlic. I would summarise it as one of those simplistic recipes that can accompany just about any Caribbean meal due to its minimalism. 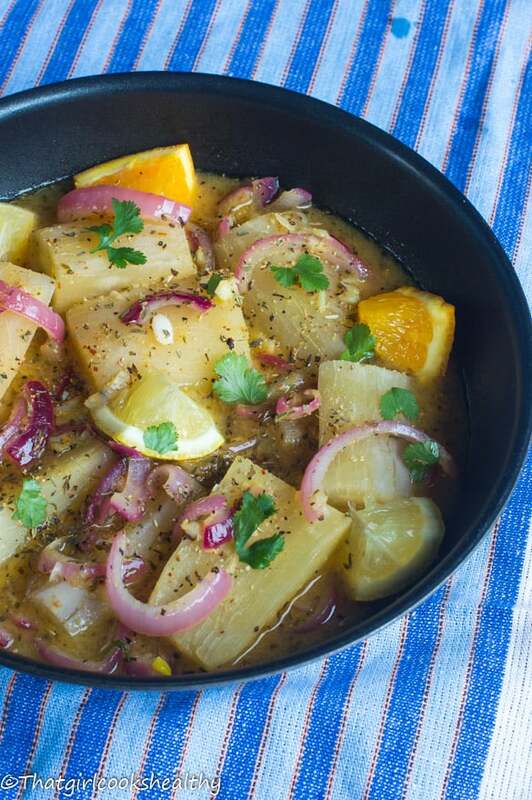 Before I began blogging, Yuca con mojo was a recipe which I liked to experiment with. I enjoy eating cassava and liked the idea of pairing it with citrus. Having made mojo (sauce) several times before I already had an idea in mind of how to re-create the original version of yuca con mojo. 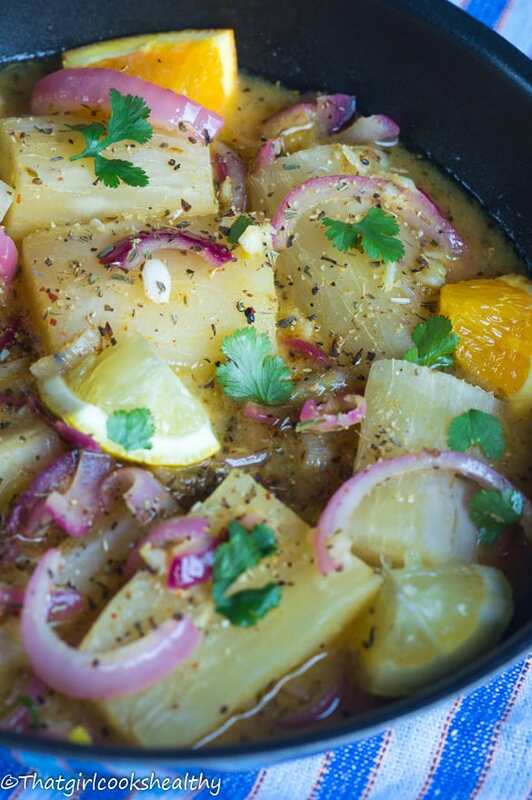 This recipe is my modified approach of yuca con mojo, I’ve added more flavour by introducing a number of herbs/spices/a more citrus to boot. The mojo has a strong citrus flavour due to the use of lemon and orange (creating a sour orange replica). Oregano and cumin are two popular herbs and spices used in Cuban cooking which form part of the mojo. Garlic and sliced onions are sauteed in a very small amount of coconut oil and added as the base note to the tangy mojo. You can balance out the tangy-ness with a subtle hint of sweetness by adding a tablespoon or two of coconut nectar or equivalent. I’m discussing the recipe in reserve here so excuse me as I haven’t even discussed the prep work for the yuca (cassava). If you haven’t peeled yuca before I have to say it’s not the most pleasant task, I really hate it. The exterior is a coarse brown wood texture which you’ll need a sturdy paring knife to peel away. The flesh should be firm and white in colour which you’ll need to cut lengthways before halving. There’s a fibrous piece of string in the centre of the yuca, you don’t want to bite into that when eating, so my tip is to remove this either before or after boiling the yuca. While it isn’t dangerous to consume, you won’t be too happy to stumble upon this or worse still if you’re entertaining guests. Feel free to serve the yuca con mojo with some black beans or even grilled fish if you prefer something non-vegan. Chop off both ends of the yuca so the flesh is exposed, then use a paring knife to cut length ways to remove the bark and the pink skin underneath. Once peeled, cut the yuca lengthways down the middle then in half so you should be left with 4 strips of yuca before cutting into smaller chunks (about 4 inches each). Run the knife along the middle of each piece of yuca to pluck out the fibrous string. Don’t worry if each chunk doesn’t contain the string just continue until all of the yuca is checked then discard the little string if found. 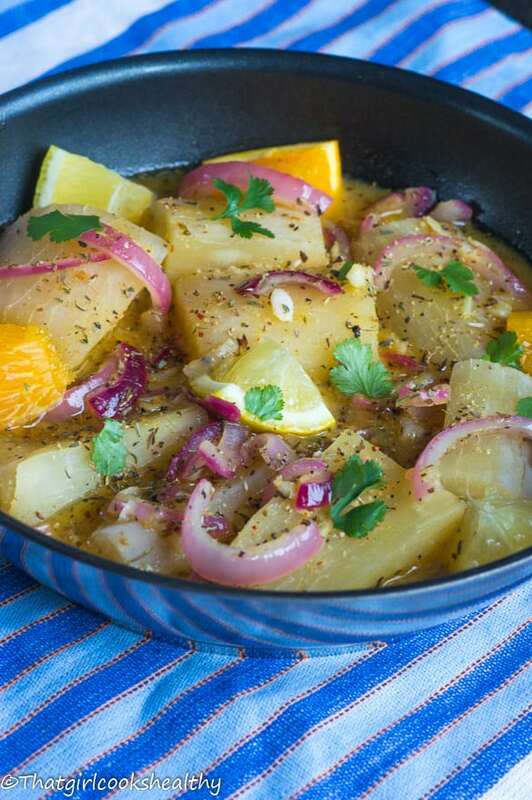 Place the yuca in a saucepan with just enough water to cover then add the pink salt along with the onion and garlic powder. Bring the pot to the boil, reduce the heat to medium, cover and simmer until tender (this should take roughly 30 minutes). Drain off the excess water and set aside. Prepare the mojo sauce by first melting the coconut oil in a frying pan on medium heat then saute the garlic and onions until soft, not golden. Quickly add the orange juice, lemon juice, oregano, cumin black pepper, coconut nectar and pink salt to the frying pan and stir until everything is combined. 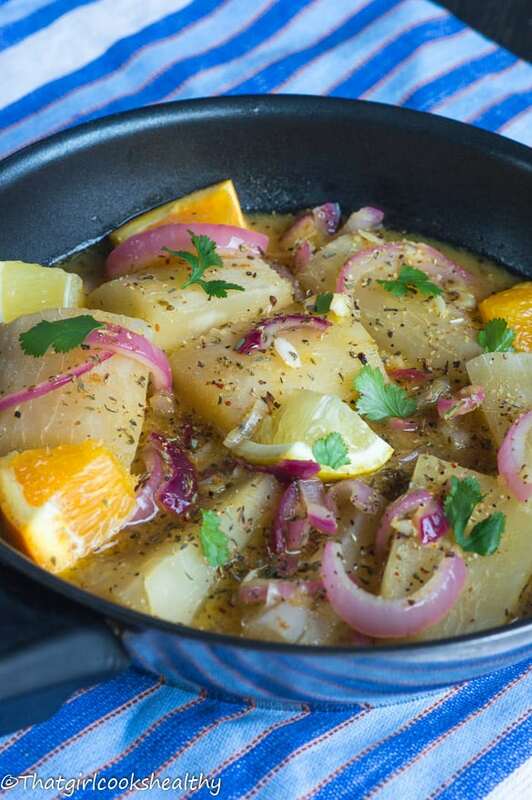 Carefully add the small pieces of yuca to the frying pan with the mojo sauce and simmer for 2 minutes before serving. I love this sauce, Charlene! Great you included the spices, it looks mouth-watering.